The Acmos Method views the body from both a matter and an energetic perspective. It is a philosophy which has its foundations in Traditional Chinese and Ayurvedic Medicine and is underpinned by the certainty, based on years of experiential learning, that under optimum conditions the body functions intelligently and is able to manage its vulnerabilities and cope with its traumas. We do not however live in optimum conditions and our electro-magnetic systems can become confused as we try to respond to the plethora of signals in our everyday environment; the challenges of our modern diet; the ‘stress’ we all feel under as we race about our daily lives. The Acmos Method seeks to work with the body’s intelligence to restore equilibrium: our innate qualities of self-management, self-repair and self- healing. The communication tools we use are the Acmos Lecher antenna, the Acmos 7 Bio-feedback and the Acmograph chart. Want to become a practitioner? Finish your training in Paris November 2015. Refreshers welcome. Iodine, an important mineral element, contributes to normal thyroid, nervous system and cognitive function, the normal growth of children, normal energy-yielding metabolism, mammary gland and foetal development, and the maintenance of normal skin. Yet in the UK and other parts of Europe iodine deficiency is epidemic, highlighted by recent surveys which found iodine insufficiency among English school age girls and Scottish women of child-bearing age. Although obtainable from natural fish, meat and dairy products, certain sea vegetables are the ideal source. Independent research at Glasgow University organized by the Seaweed Health Foundation, has shown that dried granules of Seagreens® wild Wrack seaweed can improve iodine uptake in iodine-insufficient women, with no adverse effect on thyroid function. Bioavailability and uptake was compared with potassium iodide, commonly used to ‘iodize’ table salt. Seagreens®, which naturally contains the additional micronutrients needed for metabolism, showed a slower, more balanced and prolonged uptake of an adequate level of iodine. Other researchers have shown Seagreens to be an effective prebiotic, relevant in the Glasgow iodine research because colonic fermentation helped free the iodine for nutrition. At the same time the seaweed reduces the glycaemic response to carbohydrate load, and in an award-winning study at Sheffield Hallam University, overweight subjects were less hungry with no adverse effect on nutrient uptake. A single vegetarian capsule of the pure seaweed provides approximately 350µg (micrograms) of daily iodine, with no additives. Upper tolerable limits for absorbed daily iodine are 600µg in the EU and 1100µg in the USA. 1. Bath SC, Steer CD, Golding J, Emmett P, Rayman M. Effect of inadequate iodine status in UK pregnant women on cognitive functions in their children: results from the Avon Longitudinal Study of Parents and Children (ALSPAC). The Lancet, Volume 382, issue 9889: 331-337. 2013. 2. Patrick L. Iodine: Deficiency and Therapeutic Considerations. Alternative Medicine Review Volume 13, Number 2. 2008. 3. Vanderpump MPJ, Lazarus JH, Smyth PP, et al. (2011) Iodine status of UK schoolgirls: a cross-sectional survey. Lancet 377, 2007–2012. 5. Combet E. et al. Low-level seaweed supplementation improves iodine status in iodine-insufficient women. British Journal of Nutrition. 2014. 6. Lyon V. Seagreens® as a potential prebiotic and the role of probiotic bacteria in the production of nitric oxide in macrophages. MSc Thesis, Teesside University. 2012. 7. Hall AC, Fairclough AC, Mahadevan K, Paxman JR. Ascophyllum nodosum enriched bread reduces subsequent energy intake with no effect on post-prandial glucose and cholesterol in healthy overweight males. Journal of Appetite 58, 379-386. 2012. 8. Iodine supplementation containing Seagreens is available from most health stores: Napiers’ Hebridean Seagreens Organic Kelp Capsules, Seagreens Iodine+ Capsules, Seagreens Culinary Ingredient, Seagreens Food Capsules or Food Granules. In Ireland stockists from Independent Irish Health Foods 026 65750, or visit Seagreens website seagreens.co.uk. Seagreens is also in G & G Vitamins’ Essential Food, Pukka Herbs’ Vitalise, and Viridian’s Kelp Capsules, Soul Food Greens, Essential Female Multi, and Mineral Complex products. The outstanding brand for Colloidal Silver, Heavy Metals detox and Immune support. Results RNA is an American company with a passion for science based products, that are proven to work. Originally only available through registered health professionals, the Results RNA range is now available directly. ACS 200 Extra Strength - The world’s most effective colloidal silver. With over 500 independent in-vitro kill time studies to back it up, ACS 200 has been proven over and over again to be the most powerful colloidal silver on the market. In fact most of the research that other brands quote regarding the efficacy of silver is actually based on the ACS 200 kill time studies. No other silver can even come close to achieving the kill time of ACS 200. In the most recent study with MRSA, the ACS 200 silver was found to be around 4,000 times more powerful than the next best brand. ACZ Nano Extra Strength - For heavy metal detoxification, the ACZ Nano is one of the best and safest chelators available. This natural zeolite(a type of volcanic ash) has a cage like structure that irreversibly binds heavy metals and removes them via the urinary system. Other chelators can actually mobilize the metals and then redeposit them to other parts of the body, ACZ will not do this. It also has the highest affinity for the heaviest elements, so will preferentially bind Mercury before say Aluminium and because it has been pre-treated with Ca, K and Mg, it will replace the toxic metal with one that the body actually requires. Independently proven to be able to increase urinary output of Mercury by over a 1000 times. ACG Glutathione Extra Strength - Glutathione (GSH) is one of the most critical molecules of the entire body. As the most important intracellular antioxidant, GSH regulates all other antioxidants while preventing damage to important cellular components caused by reactive oxygen species, such as free radicals and peroxides. Results RNA ACG Glutathione has been independently tested to be able to increase intracellular GSH levels by over 12% in 7hrs and can assist in helping the body maintain healthy functioning. Supercoherence Return-to-Love Frenquencies (SRTLFs), developed by Thrity Engineer, are new Light-energy-information quantum tools to handle the challenges of the Light- Energy- information age. They are a consciousness technology and a tool for transformation. SRTLFs are light-energy-information encodings restoring Supercoherence in the bio-light Field. They contain non-Hertzian frequencies that bring us into an optimal balance, which align us with the Zero point field; and other frequencies that connect us with the heart centre. The SRTLFs are here on Earth to break the karmic cycle of suffering that has been present for the last few thousand years. They reconnect us directly, systematically and precisely to ZERO where past suffering is neutralized and clarity and coherence are re-established easily, immediately and effortlessly. The SRTLFs are a master reset button to the Source code of the Human, which goes way beyond the genetic code, is absolute love and extreme Intelligence; this exists in every human at all times, though very often it does not appear to be so. SRTLFs do not contain any chemical substances - or anything measurable by traditional scientific instruments or methodologies. They Reconfigure - recalibrate - realign the human energy system with a quality of precision to supercoherence - a parameter of super function . Whole life healing and emotional health and intelligence are the resulting benefits. Today there are studies including the Kaiser Permanente ACE study (Adverse Childhood Experiences) that show that old unresolved emotional trauma creates havoc in the body many decades later. A further study by the same company showed that childhood trauma affected worker performance and health adversely: serious job problems, financial problems and absenteeism. The Results showed strong graded relations were found between the ACE score and each measure of impaired worker performance, mediated by inter-personal relationship problems, emotional distress, somatic symptoms and substance abuse. Most of these trauma imprints lie at the subconscious level and cannot readily be accessed or changed through the talking therapies. The SRTLFs clear the charge around trauma at the speed of Light. At their simplest level they are a powerful stress relief and life force energy management tool; at their most profound level they reconnect us to the energy of our heart-soul-spirit and enable us to remain clear, calm, balanced and loving in the most difficult circumstances. As we live in perhaps the most challenging times in human history where the old systems are falling apart and there appears to be no safety or certainty anywhere, the SRTLFs help us to face the uncertain present with courage, clarity and creativity. What is your professional association doing for you? What are the benefits of your annual subscription? Carole Preen, Julie Quinn and Julia Wood, experienced therapists and qualified teachers, with over 75 years industry experience between them, having pondered these issues have created a new professional association Complementary Health Professionals (CHP) to be launched at CAMExpo Olympia on 26th and 27th September 2015 - Stand 1324. Carole presents a Neuroskeletal Re-alignment Therapy Workshop on Saturday, Julie is giving a seminar on Fertility and Reflexology on Sunday. Visitors can win a CPD course of your choice, with the voucher valid up to December 2016. The three directors, working as a team for City & Guilds, wrote the qualifications now recognized as industry standard for training in Body Massage, Aromatherapy and Reflexology, have advocated the need for regulation and represented various associations on the boards of all the major lead bodies since the late 1990s, are qualified teachers and have run their own training schools and worked as senior curriculum managers in further and adult education. And all three are in private practice working with clients including traumatised children, to pregnant women, to physically disabled, to professional dancers. CHP is a merger of two long-standing associations; the Aromatherapy and Allied Practitioners’ Association (AAPA) and the British Neuroskeletal Re-alignment Therapy Association. CHP offers several categories of membership: the Premier Practitioner membership (UK members only), basic full membership, student membership, international membership and non-practitioner membership. CHP offers fully-recognized practitioner qualifications with a blend in Aromatherapy, Massage, Reflexology and Neuroskeletal Re-alignment Therapy. CHP offers blended learning diplomas which enables practitioners to study when they have the time, rather than attending regularly at a college. Students can work at their own pace; the diploma must be completed within two years. The courses are split into modules and practical workshops, on a pay as you go basis, affordable and interest free. All of the theory is studied at home; students have access to a tutor for support and email queries. Certain diplomas such as CHP’s Essential Oil Therapy Diploma, are distance-learning only, designed for those who do not want to learn to massage but are still interested in blending oils for therapeutic purposes. This diploma also comes with insurance to practice once completed. CHP also offers an extensive range of CPD courses in London in many different modalities to suit everyone, designed to help students develop their practice, in order to best serve the needs of their clients and practice. Noma Complex Homoeopathy, formed in 1984 and fronted by Sylvia Austen acts as sole agent for PASCOE products and VEGA testing equipment (medical devices for diagnosis and therapy) and provides professional VEGA training. Noma is also a major UK supplier of acupuncture products ranging from HWATO and CLOUD & DRAGON disposable metal needles imported from the Far East to auricular equipment, Moxa, lasers, acupuncture units, models and charts. With over 21 years of experience within the growing field of complementary medicine, Noma's service and competitive pricing structure are both paramount to its continued growth, and reputation as a friendly, approachable company priding itself on its professional attitude and speed of delivery. “I can’t remember the last time I felt really relaxed”. The first helpful thing I can do is to give them the experience of the very deep relaxation that can be produced with hypnosis. Many have tried self-help methods with little success, as it’s hard to dig yourself out of a hole on your own. This is where hypnotherapy comes in, offering a big helping hand through hypnotic partnership. Human imagination and emotional faculties can be powerfully activated by hypnotic suggestion; with hypnotherapy, it’s possible for the hypnotherapist to make direct contact with the client’s imagination and guide them into a profoundly relaxed state. The levels of mental and physical relaxation produced by hypnosis are reported by many clinicians to be the most profound that human beings experience in their lives. A hypnotherapist is a personal trainer for your mind, who ensures you keep on track and that you get from A to B i.e. from stress to relaxation. Once in relaxation, you’re in a clearer state of mind, and can, if you choose, remain in pure relaxation for a while, beneficial in itself (like a deep rest). You can also move on to work on reducing the causes of your stress and your personal responses to stressors through other hypnotherapy methods. You can work on designing a new future for yourself. Or you can work on changing things about yourself in the present that you don’t want any more, such as the way you interact with others in relationships, or the way you make resolutions and don’t keep them. Or you can work on how your past interferes with your present, and resolve the ties in your own mind that bind you in this way. Or you can work on all of these, moving from past to present to future. Learning self-hypnosis gives you the power to greatly help yourself with all the above. A properly-trained hypnotherapist can give direct help in the areas where our imagination, memories, and emotional thinking affect our lives. Hypnotherapy is one of the most powerful and effective ways of gaining access to the resources we need to convert our energies from stress to confidence and health. Advanced Analytical Hypnotherapy 8-13 February 2016. To enhance and facilitate further understanding among healthcare professionals about the benefits of mushroom nutrition Mycology Research Laboratories Ltd (MRL) has organized a series of Seminars, Courses and Videos. Videos accessible only to registered practitioners. Register, Select the video; password Breakspear. VIVAMAYR Academy invite you to attend a new seminar in Hormonal Regulation with Dr Harald Stossier DIBAK Head Physician of the VIVAMAYR clinic in Austria, to be held 26-27 September at The Library Space, 108 Battersea Park Road, London SW11 4LY. The regulation in the hormonal system is the “via regis” in medical treatments. Many new diseases like chronic fatigue and stress related disorders are the result of hormonal imbalance. The intention of this course is to demonstrate the diagnostic and therapeutic possibilities of Modern Mayr Medicine by using functional muscle testing, according to Applied Kinesiology, in combination with Naturopathic methods and Orthomolecular Medicine. Orthomolecular therapies for hormonal regulation. Seminar Fee £290.00. Please Confirm your reservation at the seminar to unterkoefler@viva-mayr.com or carolyn@reikopr.org.uk and make payment in advance to secure your place. The Alexander Technique improves the way we use ourselves in everyday activity. Unconsciously acquired habits in movements such as standing, walking or sitting distort the body and interfere with its natural functioning. We respond to stimuli by overtensing and/or collapsing - literally winding ourselves up (or down!). This 'mis-use' results in aches, pains, tension, fatigue or simply in feeling ill-at-ease in one's body. The Technique helps us to prevent these unnecessary reaction/habit patterns and to restore our natural 'good use' of ourselves. The Alexander Technique is not a quick fix. It is a way of learning, and a way of changing, and these things take time and application. The best way to learn the Alexander Technique is by taking individual one to one lessons with a qualified teacher. By using verbal instruction and skilled hand guidance, the teacher will take you through the practical experience of learning the Technique. Bloomsbury Alexander Centre offers a wide variety of Courses, Evening Courses, Workshops, Introductory Lunchtime Sessions, including Workshops in Voice and Cycling. All of the teachers working at the Centre are members of STAT (The Society of Teachers of the Alexander Technique). Most of the teachers at the Centre also teach elsewhere - at home, in Medical practices or Alternative Health Centres, at Drama Schools or Music Colleges. Director of Bloomsbury Alexander is Natacha Osorio who has been teaching the Alexander Technique since 1991 and has also worked extensively in private practice, teaching people from all walks of life. This 3-day workshop teaches you the basics of Radiation Assessment and Protection. GEOVITAL has been addressing radiation issues in patient’s/client’s homes in a holistic manner that has shown lasting benefit for decades now. GEOVITAL is becoming an authority on radiation protection because of their knowledge of what works in practice and works long-term. This knowledge is shared in this workshop to encourage people to take control of their home situation. Geovital hope you will join their network to help people in your area. Anyone can join and utilize this knowledge as a stand-alone service, in a health setting (doctors, therapists, naturopaths…) or in a home construction setting (architects, builders, electricians…). Seemingly complex subjects are easily explained in theory but also in practice. Attendees will be busy with theoretical components and also many practical experience both in a ‘home’ and in the field. The business of offering home radiation assessment and consultations. Record keeping of your assessment. Any work in the area of radiation protection or shielding starts with this workshop whether you are an architect, doctor, therapist, sleep consultant, painter, electrician or someone with no ties to any of these professions. If you wish to work with radiation protection you must first learn the basics to understand the relationship between cause and effect. CAMEXPO 2015 takes place over the weekend of 26-27 September at London’s Olympia, will host an exclusive panel discussion focusing on the relationship between complementary therapists and people with cancer. Organizers Diversified Communications UK has launched a new survey inviting its visitors to share their views and formulate questions for the panel. According to the latest figures, as many as one in three cancer patients have tried complementary therapies alongside standard cancer treatments. “The C Word - your questions answered”, developed in association with cancer charity Yes to Life, will feature panelists from across the CAM community. Topics will cover: working with integrative doctors and oncologists, legal regulations and ethical responsibilities, appropriate training courses, the role of exercise and nutrition, and more. The session (at 3pm on Saturday 26 September) will be chaired by Robin Daly, founder of Yes to Life, who set up the charity following his daughter’s death from cancer. Dr André Young-Snell MBBS qualified in conventional medicine from Guy’s Hospital Medical School in London in 1988. In 2002, he set up his own clinic - the Vision of Hope Clinic in Brighton - so he could specialize in complementary Metabolic Protocols. CAMEXPO offers visitors the opportunity to send in their questions to The C Word panel in advance of the show. Visitors are invited to complete a short survey about their practice and the complementary therapies that they offer to people with cancer. The results will be announced in full at the show. To complete the survey, please visit https://goo.gl/1dPzsZ. To book an entry ticket, please visit www.camexpo.co.uk/register-to-visit-camexpo-2015. Use priority code CMXP580 to register in advance for £7.50 before 25 September (tickets are £10 without a priority code, or £20 on the day). Published by Lotus Publishing. 2015. Softback. £19.99/e-book $12.41. ISBN: 978-1-905367-61-0. Anderson’s High Performance Living will help you build the strongest, most capable and most powerful body ever. Right now no matter what shape you are in, your body is an amazing machine, and has the potential to be even better. Discovering how to be your best is the most important information you can learn. Over 100 great tasting High Performance recipes - friendly on your body as well as your taste buds. Whether your goal is fat-loss, muscle gain or to generally look good naked, the HPL System is maintainable, not just a quick-fix, and you’ll enjoy balance in your life. You’ll feel healthy and energized, and you’ll be able to see and experience the world in ways you couldn’t previously. No matter what your sport, hobby or general chosen activity, you will be able to complete them all to your maximum ability. All day, every day. Ru Anderson is a performance focused nutritionist. He helps motivated and driven people to be at their best, all day every day. Ru has also toured the UK to deliver his invaluable ‘HPL’ nutrition seminar, and has been a guest speaker at some of the biggest fitness events. He’s a former ‘fat guy’ turned nutritionist, and has also competed at national level in drug-free body-building. 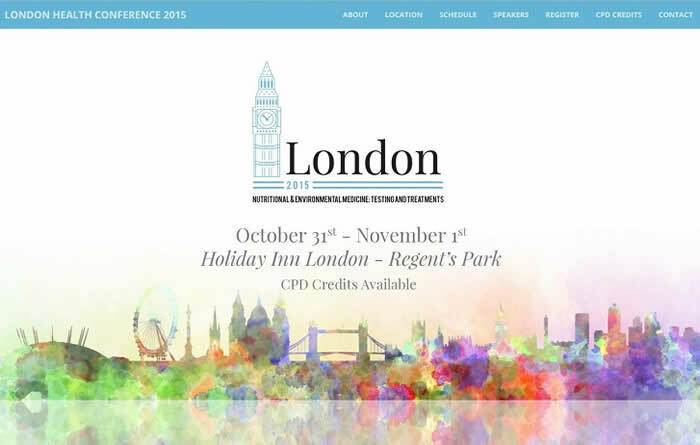 Biolab Medical Unit and The Great Plains Laboratory host conference Nutritional & Environmental Medicine: Testing and Treatments in London, UK: 31 Oct - 1 Nov, Holiday Inn London Regent’s Park. The British Association for Applied Nutrition and Nutritional Therapy (BANT) and The Naturopathic Nutrition Association (NNA) have both awarded this conference 13 hours CPD for the two day meeting. Our conferences also present great opportunities to network with other practitioners. Continuing Professional Development (application submitted and approval expected - see conference website for further details). One-day admission special offer: £150.00 (US$236) on or before 30th September 2015. World renowned cancer specialist, Professor Ben Pfeifer, a keynote speaker at CamExpo 2015, Olympia, London on 26 September 11:00-11:45am presents a seminar Integrative Oncological Treatments for Patients with Metatastic Prostate Cancer. Professor Pfeifer trained in Germany and practises in Switzerland; he is one of the pioneers in Integrative Oncology in the areas of prostate and breast cancer. His evolving protocols, based around specific plant-derived nutrients and the immunomodulator Biobran, integrate complementary protocols with conventional treatments to give his patients the best opportunity of recovery. Further information: nancy@healthy.co.uk www.camexpo.co.uk/education/seminars . In the 1950s, Dr Albert Schweitzer was one of the most famous people in the world. Now, 50 years after his death in 1965, he is much less well-known, so this one-day celebration of his life and work aims to revive interest in his remarkable life and legacy, which has inspired so many people around the world. The programme covers his life, philosophy, theology and ethics, medicine and music. Trudi Sanderson, who set up the leper village at Lambarene and had close contact with Schweitzer, will be attending. London welcomes the exciting new expo on 20-21 January - The London Health Show 2016 a free to attend trade show at Olympia. REGISTER NOW HERE! The London Health Show brings together buyers and distributors from all sectors of the UK’s healthy living and wellness marketplace. Owning a Business: Things You Need to Know by Richard Eaton is full of tips about setting up a business and also contains sections of interest to established small business owners. The book covers cyber security, exporting to overseas markets, alternative sources of finance, advertising through social media, maintaining a work-life balance and finding local and national business support services. It can be purchased both as an e-book and as a pocket-sized flat-bound printed book directly from Amazon. In a clear, concise and straightforward format, it provides detailed information about how to start and then manage a small business. The Trill Autumn Seasons Box is a box of organic, wild-harvested and natural autumnal products for the home and body from Romy Fraser’s Trill Farm in Devon. Trill Seasons Boxes are beautifully presented, ethically produced and environmentally friendly, just as you might expect from the founder of Neal’s Yard Remedies. Trill Seasons Boxes are delivered up to four times a year, in spring, summer, autumn and winter and offer a range of seasonal products, created using minimal, yet beautiful packaging. The Learning Architect is an international consortium of behavioural skills specialists, who have developed a portfolio of solutions around resilience which include: one-day resilience workshops, half-day resilience workshops, bit-sized sessions of 60, 90 or 120 minutes, key note conference presentations, e-learning solutions, books and seminars. They are also hosting an open Resilience Masterclass in London on 22 October and in Cheltenham on 12 November. Learning design live launches at the renowned World of Learning Conference and Exhibition. Eating foods rich in amino acids could be as good for your heart as stopping smoking or getting more exercise, according to new research from the University of East Anglia (UEA). A new study published in the Journal of Nutrition reveals that people who eat high levels of certain amino acids found in meat and plant-based protein, have lower blood pressure and arterial stiffness. This association is similar to lifestyle risk factors, including salt intake, physical activity, alcohol consumption and smoking. Researchers studied the effect of seven amino acids on cardiovascular health among 2,000 women with a healthy BMI. Data came from TwinsUK - the biggest UK adult twin registry of 12,000 twins. Hawkwood is a place to inspire; it is a centre for future thinking, with authenticity, integrity and good food. Hawkwood is an ethical centre providing courses, facilitating training and offering venue hire, set in a beautiful location in the Cotswolds. Take advantage of their offers this autumn: book residentially mid-week to receive a 10% discount, non-residential mid-week offers 5% discount. Hawkwood is a Grade II listed 19th Century country house with 30 bedrooms which can sleep up to 50 people, located in the Cotswolds. Janey Lee Grace, No 1 best-selling Natural Health Author and Natural Living expert presents the 2015 Platinum Awards for the Natural Health and Beauty World. Janey will be awarding the small companies who are jostling for the awards for Skincare and Beauty, Make-up and Hair, Supplement Awards and other categories such as Healthy Food and Drink categories and best mum and baby products. Eureka Cream was voted Best Eczema/Psoriasis Cream. Mr Michael Dooley, Consultant Gynaecologist at the Poundbury Clinic at King Edward VII’s Hospital, argues all women should have a fertility check regularly, to maximize their ability of successfully having a child. A new study revealed that women hooping to have three children naturally, should begin trying at the age of 23. The study comes from Erasmus University in Rotterdam and compiles 300 years’ of fertility data from over 58,000 women. If you are training hard, a loss of short term muscle strength is an inevitable part of exercise. In a recent study researchers asked participants to perform high intensity arm exercises which induced muscle damage. Prior to the exercise, half of the participants had taken a ginger supplement for five days and the other half had taken a placebo. Twenty-four hours after exercise, as expected, both groups had lost significant arm strength, however the two groups differed in how quickly the strength loss improved. In the group who had taken the ginger, strength improved 48 hours after exercise, where the placebo group however, didn’t improve until 72 hours after exercise. Natur Boutique’s Organic Ginger Tea is made solely from 100% pure organic ginger. UK National Health Service patients have awarded Brighton-based charity Grassroots their top award for design of the mobile app Stay Alive which prevents loss of life. More than 30 innovative projects which improve vulnerable people quality of care and assist self-help safety were assessed and judged by a patient panel. The awards are sponsored by NHS Clinical Commissioning Groups; the content offers immediate advice to people considering suicide and to care-givers who may be able to use the information to save the life of a loved one. National Stress Awareness Day is 4 November 2015; the winter months can be a stressful time for many. The Drip & Chill IV Infusions at EF MEDISPA, offer an hour of respite in a relaxed environment, while also recharging the body with essential vitamins and minerals providing clarity of mind and making stress a more manageable. Drip & Chill™ by EF MEDISPA have an exclusive menu of intravenous vitamin therapies. Ten mixes have been created to support conditions including low immune system, dehydration, weight loss, improving athletic performance and to boost the libido. 88% of men keep their phone in their pocket when on the go: 63% of those surveyed didn’t know phone radiation can affect sperm health, 75% of men aren’t worried. 67% of young people do not realize there may be a connection between phone radiation and fertility. WaveWall mobile phone cases are aimed at men who keep their phone in their pockets and protect against mobile phone radiation going into men’s testes. Several studies have shown a negative impact of low-level electromagnetic radiation (EMR) on the sperm count, motility, viability and normal morphology. Litozin+ may provide relief for sufferers from recurrent joint pain or arthritis. Litozin+ is a supplement made using specially processed rosehip berries containing vitamins, minerals and antioxidants. Litozin+ is the only product on the market which contains the active ingredient Rosenoids which have anti-inflammatory properties and help to reduce pain, stiffness and joint inflammation. Taking just three Litozin+ capsules, or one sachet every day is shown to help ease the discomfort and swelling of painful joints and increase mobility. Often triggered by head trauma, a neurological infection or severe stress, fibromyalgia symptoms include musculoskeletal pain, fatigue, memory loss and mood swings. Hyperbaric oxygen chambers expose patient to pure oxygen at higher than atmospheric pressures, and are commonly used to treat patients with embolisms, burns, carbon monoxide poisoning and decompression sickness. The clinical trial, which exposed participants to two months of hyperbaric oxygen therapy found significant changes in brain activity and symptoms of 70% of participants. The successful treatment enabled patients to reduce or eliminate their use of pain medications. A gene signature which could be used to predict the onset of diseases such as Alzheimer’s, years in advance has been developed in research published in the open access journal Genome Biology. The study aimed to define a set of genes associated with healthy ageing in 65 year olds. Such a molecular profile could be useful for distinguishing people at earlier risk of age-related diseases. This could improve upon the use of chronological age and complement traditional indicators of disease, such as blood pressure. Essential Solutions School of Complementary Therapy opened its doors in Kimberley, Nottinghamshire one year ago and has seen the graduation of its first students. Run by Caroline Bradley, the Centre provides a hub for holistic activities in the Nottinghamshire area. Caroline’s colleges offer lessons with lower tuition fees than most government funded further education colleges, along with flexible hours helping students to train. Caroline also offers taster courses in Massage, Aromatherapy, Reflexology and Meditation. National Institute for Health and Care Excellence published a quality standard to help improve maternal and child nutrition. Healthy diet is important for women who may become pregnant; the woman’s nutrition influences and lays the foundations for her child’s health. The mother’s own health also depends on how well-nourished she is during and after pregnancy. Diet is linked to many common childhood conditions such as iron-deficiency anaemia, tooth decay and vitamin D deficiency and can also affect the risk of developing coronary health disease, diabetes and obesity in adult life. Tel Aviv University research has revealed the impact of skipping breakfast on type-2 diabetics. Fasting until noon triggers major blood sugar spikes (postprandial hyperglycaemia) and impairs the Insulin responses of type-2 diabetics the rest of the day. The study was conducted by TAU’s Prof. Daniela Jakubowicz and Prof. Julio Wainstein of the Wolfson Medical Center’s Diabetes Unit, Prof. Oren Froy of the Hebrew University of Jerusalem and conducted on 22 type -2 diabetics who averaged 56.9 years old, with a mean Body Mass Index (BMI) of 28.2kg/m2. Over two days, the participants consumed precisely the same number of calories and the same balanced meal for lunch and dinner. The only difference was that one day they ate breakfast and the second day they fasted until lunch. Research from the University of East Anglia has shown that serious falls are twice as likely in older men who take medicines with anti-cholinergic properties, which is commonly prescribed for older people with bladder problems, depression, psychosis, insomnia and respiratory problems. The results have been published in the Journal of the American Geriatrics Society. Medications with anticholinergic properties affect the brain by blocking a acetylcholine, involved in passing messages between nerve cells. This can lead to side effects including blurred vision, increased heart rate, sedation and confusion. Dr Sally Norton, leading UK Health Adviser, offers research-based input on current health issues. Sweetened with honey, contains natural fruit juice or similar claims have us believing that their products are sweetened with something better than simple everyday sugar. Honey is almost 100% sugar, so is fruit juice; minor nutritional benefits they may provide could be better obtained from other foods, without tooth-rotting potential or empty calories. Research published in BCM Medicine showed that UK black men have twice the lifetime risk of being diagnosed with and dying from prostate cancer, compared with UK white men. The study also found that Asian men have about half the lifetime risk of being diagnosed with and dying from prostate cancer, compared with UK white men. The lifetime risk for dying from prostate cancer in the UK is estimated to be 1 in 44 (2.3%) for Asian men, 1 in 24 (4.2%) for white men and 1 in 12 (8.7%) in black men. Polycystic Ovary Syndrome (PCOS), affecting millions of women across the UK, is a hormone related problem caused by small cysts growing on a woman’s ovaries, which subsequently cause a hormone imbalance. The main symptoms vary from woman to woman; some people will also suffer more severe symptoms than others. The most common symptoms include: difficulty in getting pregnant due to a lack of ovulation, weight gain, acne, irregular periods, hair loss from the head and excessive hair growth all over the body. If you think you suffer from PCOS book in to see your GP who can carry out checks and rule out any other conditions. Excilor®’s TransActive Technology is clinically proven to penetrate the nail bed within minutes. The technology uses acetic acid, which rapidly reduces the nail’s pH, changes the nail’s environment, making it more hostile for fungi to grow. Excilor® is also enriched with nail lipids and biotine for supportive nail care during treatment, helping to rebuild damaged nail structure, providing a long-lasting barrier against future fungal infections. Further information Tel: 020-7498 8211; nadia@fuelrefuel.com www.excilor.com/faq/ Available from Boots, Superdrug, Lloyds Pharmacy, Amazon and leading pharmacies.